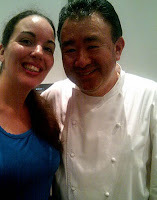 Cocina de Mama: Cooking with Tetsuya! Japanese Cuisine Scampi, Spatchcock and Kingfish. Cooking with Tetsuya! Japanese Cuisine Scampi, Spatchcock and Kingfish. 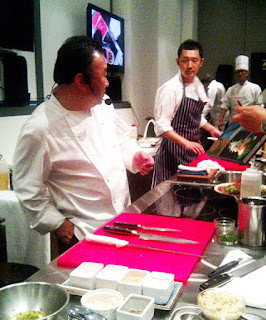 I had the amazing experience yesterday of being in the prescence of one of the world's top Chefs and I wanted to share some of his recipes, tips and philosophy on cooking! Tetsuya is originally from Japan and came to Australia over twenty years ago to start a stellar career and end up being a three hat chef! You can find out more about Tetsuya here. Like most immigrants Tetsuya found success with his cooking by using traditional recipes and over time combining them with new flavours of his adopted country, whilst remaining true to the simplicity and flavours of the ingredients he uses. I'll share with you a few of the dishes he made on the day! "This dish is simple tasting but easy to do at home". 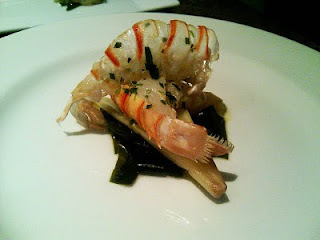 "Cook Scampi on low heat (65degrees in oven) so as not to make it mushy - slow cook is better." Mix the juice of lemon and lime with tarragon and brown sugar to taste. Stir in olive oil. Cut the witlof into quarters amd grill on both sides and arrange on top of wakame. Place on top of the witlof and pour over a little citrus dressing. "You can add and create dishes - not that hard - okay to experiment." "Every Chef has a passion to cook but first a passion for eating - if you don't like eating why cook?!" Place spatchcock halves into a deep baking dish. skin side up. Season with salt and pepper. Cook with the bones, it will add amazing flavour to the dish. Pour the wine over each of the spatchcocks until the liquid reaches half way up the sides of each spatchcock. Add water if more liquid is required. Sprinkle 1 teaspoon of paprika. Add the capers, olives, garlic and oregano to the iquid. Let the juice or brine from the olives fall into the mixture too. 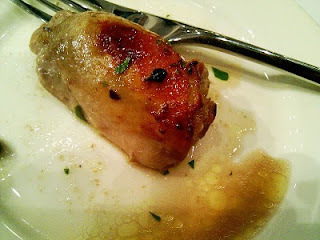 Drizzle the olive oil over each spatchcock halve and place in the pre-heated oven to cook for 45mins, or until the skin is golden and spatchcock is cooked through. To serve, place in the centre of serving plates and spoon over a little of the liquid. With the liquid - if you have some left over, Tetsuya recommends mopping up with crusty bread! Another tip if you have enough juice is to cook up some pasta and serve fresh with some parsley to garnish. 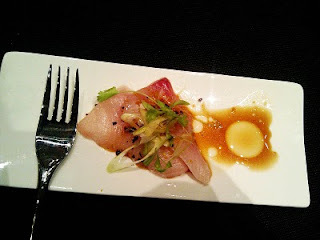 Season the fish with soy marinade. Place all the herbs, black beans, citrus, leeks and scallions on and around the kingfish. Heat up the grape seed oil and carefully pour over the fish. Finish with a little olive and a little salt oil and serve.